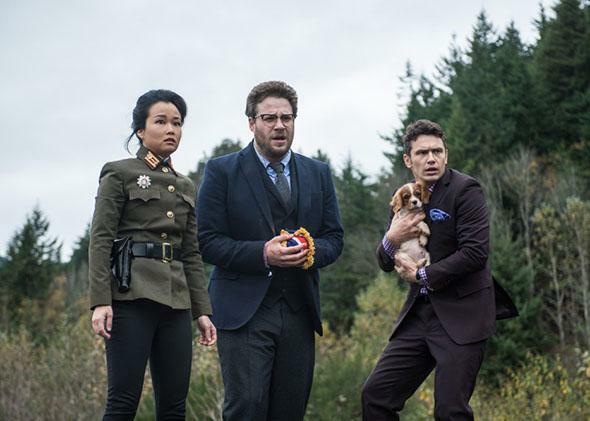 The Interview movie review: Sony releases the Kim Jong-un comedy online (VIDEO). Watch it to battle tyranny! But not for the laughs. James Franco, Seth Rogen, and Diana Bang in The Interview. Christmas has come early for free speech proponents: At 1 p.m. this afternoon, Sony released the controversy-riddled, previously-withheld Kim Jong-un assassination comedy The Interview via YouTube, Google Play, Xbox video, and Sony’s website. And on Christmas, if you happen to live in a select few cities, you can march down to your local movie theater and check out the much buzzed-about but little-seen film that has spawned a plethora of think pieces. Within a week, we’ve gone from being told we won’t be able to see the movie at all to having a variety of viewing platforms at our disposal. But now that freedom of expression has prevailed, kind of, should you actually watch the movie? Sure, if you’ve got a couple of hours to kill and want to support free speech by paying a corporation for their nearly laugh-free comedy. While the ludicrous premise sounds intriguing on paper—Entertainment Tonight–style talk show host Dave Skylark (Franco) and his BFF producer Aaron Rapaport (Rogen) land an interview with Kim Jong-un, and are tasked by the CIA with assassinating him—the execution never lives up to its promise. It also seems as though Franco and Rogen’s chemistry is wearing thin. They argue with and/or freak out at each other a lot here—this is basically just Pineapple Express II: The Quest to Assassinate Kim Jong-un—but the humor never quite lands, as when Dave announces that he plans to renege on the assassination plot due to his newly kindled friendship with Kim … with a quick rat-a-tat between the friends about “pulling out,” har har. Still, give the movie credit for effectively mocking a dictator who certainly deserves it. The Interview may not succeed as a true comedy, but it does manage to excoriate Kim Jong-un, particularly in the film’s climactic interview (“Why don’t you feed your people?” Dave asks on live broadcast TV) and his ultimate demise. (That scene’s just like you saw it on the Internet.) So the movie has that going for it, at least. But if you like your dictator mockery served on a sharper, smarter dish, you should probably just do what everyone else seems to be doing, and rewatch Team America: World Police.